Vehicles drive past an anti-Brexit placard that is placed near the Parliament in London, Jan. 29, 2019. 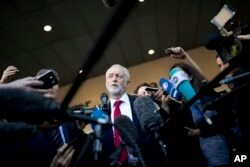 European Union leaders have ruled out British Prime Minister Theresa May's attempt to renegotiate the terms of Britain's exit from the bloc in March. 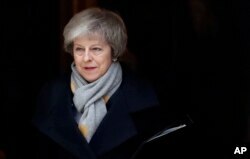 The British parliament Tuesday approved May's request to the EU to re-work the Irish border provision of the current Brexit deal. 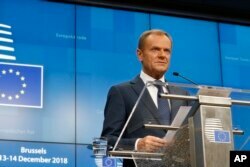 FILE - European Council President Donald Tusk speaks during a media conference at an EU summit in Brussels, Dec. 14, 2018. "The Withdrawal Agreement is and remains the best and only way to ensure an orderly withdrawal of the United Kingdom from the European Union," the spokesman said. "We continue to urge the UK government to clarify its intentions with respect to the next steps as soon as possible." Britain's House of Commons rejected May's Brexit plans two weeks ago, primarily because of the Irish border provision, known as the backstop. Without an agreement in place, Britain faces a "no-deal" Brexit departure. 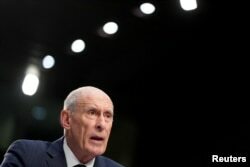 U.S. Director of National Intelligence Dan Coats told a congressional panel in Washington Tuesday that such an outcome "would cause economic disruptions that could substantially weaken the [United Kingdom] and Europe." May's Conservative Party is now supporting what it calls "alternative arrangements" to overcome the concerns about tying Britain's policies to EU rules.